I have written about this topic some time ago; but the cases continue to roll in, so its time for an update. I could not count the number of times a walker has come to see me for help with their sore knees following a long hike in the hills, or following an event like the Oxfam Trailwalker 100km. They may hobble up the path to my office and describe suffering a tightness and diffuse pain in one, or both knees. It is typical that their knees have been troubling them for several weeks or months and they have had many physiotherapy treatments without relief. Although they may be complaining of knee pain and although they may have had a diagnosis of, say, wear under the knee cap, or the kneecap not tracking correctly, these often turn out to be "red herrings". More often than not we will find swelling and pain around about the lower inside of the knee, skirting around to the back of the joint. The knee joint itself, may be fine. This kind of injury is most common in walkers but also found in distance runners and cyclists. 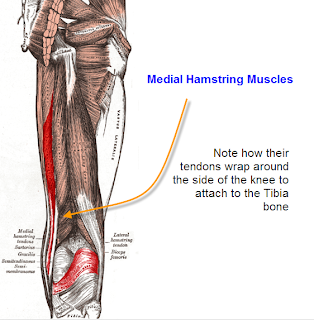 The cause of this pain is excessive rubbing of the tendons of the inner thigh at the point where they wrap around the inside of the knee bone. There may also be pain and swelling at the point of attachment of the tendons to the tibia just below and to the inside of the knee. In some people, especially women, this may appear as a swollen and soggy mass just below and to the inside and rear of the knee. It is quite surprising just how swollen and painful this region can be and even more surprising how long it can go without prior detection. Knee pain of this kind is more common in women than men, possibly because of their having softer collagen. Walking seems to be particularly conducive to this injury, although it is present in runners and walkers. The repetitive straightening of the knee may inflame the inner knee tendons and they consequently swell. With this swelling, the tendons rub more than ever, causing further swelling. Its a vicious cycle. As time passes there is progressive scarring and thickening of the tendons and surrounding tissues. Rest, on its own, gives little more than temporary relief. Treatment consists of deep tissue massage of the inside and front of the knee where the affected tendons slide and where they insert into the tibia and form the knee joint capsule. This must be done by a trained and experienced therapist. It may also be helpful to give dietary supplements such as vitamin C, zinc, magnesium, manganese and silica which aid tissue healing. Look for areas that are tender and swollen and concentrate on massaging these. Where there is visible swelling, the massage technique used is "effleurage" to shift the fluid out and towards the heart. Massage the affected areas firmly but gently for several minutes using a quality massage oil. Stay within pain limits - you are not setting out to hurt - only to heal. Repeat the therapy at seven day intervals for as many sessions it takes to be completely recovered. Do not massage hard in between: Stick to gentle effleurage which will assist healing. Exercise as per normal, using pain and discomfort to guide just how much to do at a time. While there may be pain when touching the massaged areas, there will be improved function, such as being able walk more freely. There is usually marked relief by about the fourth session and complete recovery by about eight or nine sessions (weeks). Knee injury prognosis procedures could be conveniently understood when you are aware of your knee anatomy in depth. The human leg shape and the crucial understanding about the several disorders can improve your comprehension regarding the possible traumas. The knee is regarded as the vital portion of your legs, they've created the movement in human beings. This joint as well as the different parts involved in its functioning could be effectively revealed by the medical doctor throughout your knee problem analysis.